In 515, Amalasuntha married Eutharic (c. 480 – 522), an Ostrogoth noble of the old Amali dynasty who had been previously living in the Arian Kingdom of Hispania. Her husband was the son of Widerich (born c. 450), grandson of Berismund (born c. 410), and great-grandson of Thorismund (died after 400), king of the Ostrogoths c. 400. It was important to Amalasuntha's father, Theoderic the Great, that she marry into a legitimate royal family, lest her own family's legitimacy be questioned. She was very much an intellectual, and was well known for her extensive knowledge, which included the study of three languages, Latin, Greek and Gothic. In addition, she was a student of philosophy and was said to possess the wisdom of Solomon. Amalasuntha was also described in her day as possessing all of the central Roman virtues expected of a noble woman: Happiness, fertility, and patience, although more emphasis was placed on her virtues within the political realm versus the feminine, something that separates her from other Ostrogoth princesses. Her husband died, apparently in the early years of her marriage, leaving her with two children, Athalaric and Matasuntha (c. 517 – after 550), wife c. 550 of Germanus. On the death of her father on 28 August 526, her son succeeded him at the age of ten, but she held the power as regent for her son. Her tremendous influence in her position as regent can be seen in a diptych she appears in alongside her son, Athalaric, in 530. Deeply imbued with the old Roman culture, she gave to that son's education a more refined and literary turn than suited the ideas of her Gothic subjects. Conscious of her unpopularity she banished — and afterwards put to death — three Gothic nobles whom she suspected of conspiring against her rule. At the same time, she opened negotiations with the Byzantine emperor Justinian I with the view of removing herself and the Gothic treasure to Constantinople. Her son's death on 2 October 534 initially made little apparent change in the posture of affairs. After Athalaric's death, Amalasuntha became queen, ruling independently only for a short while before making her cousin Theodahad partner of her throne (not, as sometimes stated, her husband, for his wife was still living), with the intent of strengthening her position. Theodahad was a prominent leader of the Gothic military aristocracy, the very group that so opposed her pro-Roman stances. Amalasuntha believed this pairing would help to make supporters out of her harshest critics. The choice was unfortunate, for Theodahad fostered the disaffection of the Goths, and either by his orders or with his permission, Amalasuntha was imprisoned in the island of Martana in the Tuscan lake of Bolsena, where on 30 April in the spring of 534/535 she was murdered in her bath. 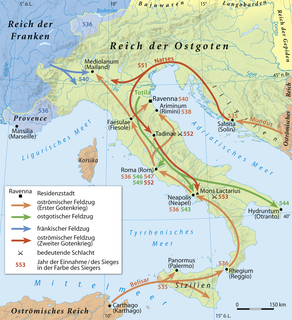 The death of Amalasuntha would give Justinian a reason to go to war with the Ostrogoths and attempt to take Italy. According to the Eastern Roman historian Procopius, it is believed that Amalasuntha and Justinian I had a very close diplomatic relationship. More specifically, Procopius believed that Amalasuntha was thinking about handing over Italy to Justinian around the time of her death. Shortly after Amalasuntha's murder, Theodahad was replaced by Witigis, Amalasuntha's son-in-law. With the people's support, Witigis had Theodahad put to death. The letters of Cassiodorus, chief minister and literary adviser of Amalasuntha, and the histories of Procopius and Jordanes, give us our chief information as to the character of Amalasuntha. Cassiodorus was a part of a greater pro-Roman party that desired to Romanize the traditional Ostrogothic kingship, further evidence of the pro-Roman circle that Amalasuntha surrounded herself with. The life of Amalasuntha was made the subject of a tragedy, the first play written by the young Carlo Goldoni and presented at Milan in 1733. Asteroid 650 Amalasuntha is named in her honour. ^ a b c "Amalasuntha". ISBN 978-0-19-518792-2. ^ a b Sarantis, Alexander (2009). "War and Diplomacy in Pannonia and the Northwest Balkans during the Reign of Justinian: The Gepid Threat and Imperial Responses". Dumbarton Oaks Papers. 63. JSTOR 41219761. ^ a b c Vitiello, Massimiliano (2006). ""Nourished at the Breast of Rome": The Queens of Ostrogothic Italy and the Education of the Roman Elite" (PDF). Rheinisches Museum für Philologie. 149. ^ a b Grierson, P. (1941). "Election and Inheritance in Early Germanic Kingship". The Cambridge Historical Journal. 7 (1). JSTOR 3020840. ^ a b c d One or more of the preceding sentences incorporates text from a publication now in the public domain: Chisholm, Hugh, ed. (1911). "Amalasuntha" . Encyclopædia Britannica. 1 (11th ed.). Cambridge University Press. p. 777. ^ Foote, David (2009). "Reviewed Work: Il principe, il filosofo, il guerriero: Lineamenti di pensiero politico nell'Italia ostrogota by Massimiliano Vitiell". Mediaevistik. 22. JSTOR 42586872. ^ Schmadel, Lutz D. (2012), Dictionary of Minor Planet Names, Springer, p. 63, ISBN 3642297188. Theodahad, also known as Thiudahad was king of the Ostrogoths from 534 to 536 and a nephew of Theodoric the Great through his mother Amalafrida. He is probably the son of Amalafrida's first husband because her second marriage was about 500 AD. His sister was Amalaberga.